The Skyrim Additonal Music Project aims to provide new music for Skyrim, both as an addon and as a replacer. Currently it contains 60 tracks, providing over 3 hours, 43 minutes and 53 seconds of homemade music. April 1st: The complete Additional Music Project can now be easily listened to on Youtube. I made a video featuring every track. This way you can easily scroll through the tracks. March 26th: The Additional Music Project is now for sale! You might all have noticed that I gave away the mp3's to this mod from day one, so now giving the chance for people to actually pay for it seems kind of stupid. Stupid or not, you can now show your appreciation of this mod by financially supporting the guy who made it. You are not obliged or pushed, you have been given the opportunity. As I'm trying to get some more work as a composer, and working my day job, so I haven't had the time to make new tracks. I'm not ruling out there won't be any in the future, but at this point it seems more likely I'll just wait for a new TES game to come out, if I can't make the professional side of this endeavor work out. The support for this mod has been, and continues to be amazing, so thank you all for giving it a shot and giving me your great feedback. May 18th: the mp3 section has been updated! New version is finished, adding 5 tracks to the mix. 1_6 is ready for the replacer as well as the Addon version. The Deluxe version is still under construction and the MP3 download hasn't been updated yet. Enjoy, and remember to always pick flowers before picking a fight. Upon startup, go to DATA FILES in the launcher and tick AdditionalMusicProject.esp OR AdditionalMusicProjectReplacer.esp (NEVER BOTH!!) depending on whether you want the vanilla music to be disabled or not. Using the replacer version DOES NOT delete the original music, it just disables it. 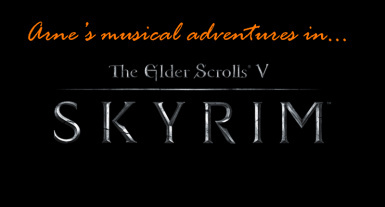 The esp offered here contains 30 tracks I've written so far as additional material to the music of Skyrim. In the future, this collection will be updated with new tracks, instead of releasing seperate packs. As an optional file, there is a small guide available explaining how to tweak this mod with the Creation Kit. As another optional file: the mp3's, good for Oblivion and media players. The aim of the Skyrim Additional Music Project is to make music that doesn't stray very far from the music of the Elder Scrolls and even when it does, it should be more an expansion than an overhaul. It aims to add music and not really to replace it, but I've made a replacer as it was requested. The filepath for the xwm's (Skyrim's version of mp3's) should be /data/music/Additional Music Collection. The .esp goes in the /data folder. This is a hobby of mine, not a profession, please keep that in mind :). Constructive feedback, comments, suggestions and questions are always welcome. Before you know you're going to have a dragon encounter, or bandit raid or somesuch, save the game. Load it and play until you have the confrontation with the dragon. If you haven't heard a new track after anywhere between 7 and 10 tries, it's not working. The game picks the tracks at random, but after 10 tries you can rule out bad luck. listed here are the ten newest tracks. There is a full youtube playlist here . No_Aardvarks_Allowed for the great tutorial and the awesome Personalized Music Mod , in which you can also use the xwm's from this mod. Version 1.3 of the mod is released! The Deluxe version contains the mp3 of every track (hence the large file). Now this mod contains 44 tracks, which translates to roughly 2 hours and 45 minutes of music. This mod is available as a replacer or as an add-on version. Dear users, I've altered the file to Additional Music Project. Now the folder will be music/Additional Music Project and the esp's name will be Additional Music Project. Sorry for the bouncy behavior but after releasing this mod on Steam, some tweaking was required. I do this now in order to smoothen the updates in the months to come when new music arrives. The old esp and folder (Additional Music Collection) will not be updated, so bite the bullet now and redownload :). Sorry for the inconvenience, organizing isn't my strong suit, yet ;). A replacer version is in the works, but I'm going to test it myself before releasing it. There is a 'beta' update available in the download section under Update Files. This update contains 7 new exploring tracks. You need to download the June 2013 update file and extract it somewhere (preferably desktop) and copy the new xwm's manually to the Valve/Steam/SteamApps/common/skyrim/Data/Music/AdditionalMusicProject directory. Also download the new .esp and just overwrite the old one. For the replacer version it's a bit different. I've made a seperate .esp called AddtionalMusicProjectReplacer1_2b.esp. This was as a precaution and it will now show up as a seperate .esp in your data files in the launcher. When the update becomes definitive, I'll put up an .esp that overwrites the regular one. When playing the game, ONLY USE ONE OF THE ESP's! So untick AddtionalMusicReplacer.esp and tick AddtionalMusicReplacer1_2b.esp! The new version is out, bringing the total to 50 tracks and 'finally' crossing the 3 hour mark. As with 1_3, the mod comes in two forms, the regular and Deluxe version. The latter has the mp3's of every track in there too (not at all relevant for the game itself, just for media players and such). I haven't had a lot of time testing it, so please share your thoughts in the comment section. April 11th: Small update with two tracks and volume + assignment fixes. When you download this, just extract the rar file tot the /data folder and overwrite anything your pc asks you to. This is an update for the replacer version only and you require 1_5 for this to work!. I've uploaded an update which contains 5 more tracks: One dungeon track, two city themed tracks and two nighttime tracks. The main and Deluxe file have been updated and there is also an update available for 1_4 users. Consult the guides a few paragraphs down. The MP3 seperate download is available as well. The update is for the replacer as well as the regular version. Manually add the 6 new tracks to the Data/Music/Additional Music Project folder and replace the ESP's in your data folder with the ones you have got in there now. This update introduces new music to the keeps as well, which is a first for me :).